Jeff Knapple, president and CEO of Van Wagner Sports and Entertainment, and Chris Allphin, senior vice president, team and venue services at Van Wagner Sports and Entertainment, have found an abundance of opportunities within a new 5-year, $600 million contract with FC Barcelona. 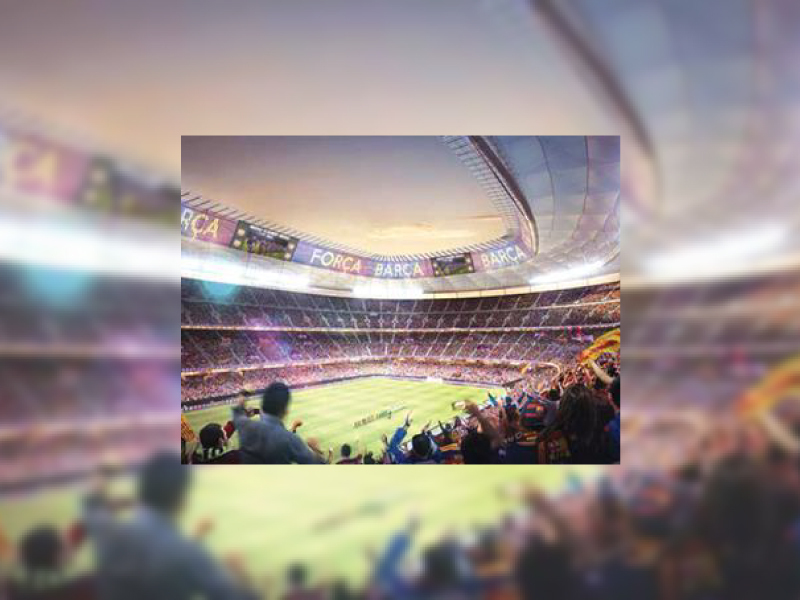 As one of the largest sports franchises in the world, FC Barcelona stands to gain a tremendous amount from the right approach to its new stadium and the surrounding area. By looking at the yet-to-be-named stadium for FC Barcelona as a destination, instead of a place to watch sports alone, Knapple and Allphin are excited to bring discernment and long-term cooperation to the enterprise. A skating rink, commercial zones, business offices, and restaurants are just some of the ways in which the space will be that much more attractive to every possible demographic. While the scope of the project might seem daunting on paper, the pair shared with Venues Today that widening the breadth of what the venue can do has only helped to propel them into the future. How does an international deal compare to the domestic naming rights deals previously done by Van Wagner? Jeff Knapple: A new build of a stadium in the U.S. is a range, from on the low-end $400-$500 million to the upper end. We handled MetLife Stadium [East Rutherford, N.J.] for the New York Jets and the New York Giants back in the day, and that was a $1.6 billion stadium. If the economic analogy is what you’re looking for, then this is well within the wheelhouse of many things we’ve done. Chris Allphin:-We’ve known for a while that we needed to get to Europe. We didn’t want to do it by accident or with the first deal that came along. We wanted to pick the right deal. We’ve been looking at a lot of different opportunities in Europe, and it doesn’t get a lot better or a lot bigger than FC Barcelona and the opportunity there. We think it’s the perfect way to introduce ourselves to Europe. What background experience do you bring to this deal? JK: Through (his and Knapple’s) commonality of understanding, which has been naming rights-oriented or stadium revenue maximization-oriented, we have evolved a business to build something very different here at Van Wagner than just selling naming rights. We’re much more integrated with technology development, premium ticketing and production services. We have a lot of different areas we address because we firmly believe that the greatest ability to maximize revenue is connected by a fan experience, and the simplicity of fans having a fun experience at the stadium, ballpark, whatever it may be. What challenges have presented themselves during this process? JK: In the U.S., the ability to build and finance and so forth has been a process over the last 30 or so years, where it’s understood the banks lend against that. There’s major saturation here of stadiums that have been built and named. In Europe that process has been slower to develop, it’s been more difficult for the individual and teams to finance and develop and build or renovate stadiums. That process lags behind what’s going on in the U.S. That said… we worked on the Emirates Stadium deal for Arsenal back in London, so we have great familiarity and presence and knowledge about what takes place. The lead time, the sales time, the amount of contractually obligated income and how that works with stadiums is an evolving process in Europe, and one that we believe in. How have FC Barcelona and Van Wagner meshed together as partners? JK: We developed a business model that Chris and I embraced… and that was to integrate different touch points, services, capabilities and expertise across different parts of the fan experience that we think we can effect. In the case of Barcelona, you have arguably one of the top three or four clubs on a brand-stature-basis worldwide…. Their fan base is arguably, if you look at a statistic level, almost 10 times what the largest fan base would be for an NFL team, just to put it in perspective. There’s a culmination of different factors that matter, and makes this opportunity appealing to a different and broader base of potential brands or companies that want to be involved in the world’s number one sport. What does Van Wagner stand to gain from this partnership? JK: I think it’s a great opportunity to get our message out there, to talk about what we’re doing and how it’s different from what our competitors do; it’s just a much bigger stage…. When a team has 300 million fans, then a lot of people are interested in talking about it. We have a great opportunity to tell the world about what we’re doing and have a great case study when we’re done. How are you going to bring in more sponsors? How is this project different from the domestic projects you’ve been a part of? CA: In the case of Barcelona, you’ve got a five-year construction, but there are many things that are going to take place, and part of what they are doing that is unique is building as they go, while not asking the team to relocate to play its game. That is a nuance that is different from most of the situations that we find ourselves in in the U.S. But, that said, it’s an opportunity to also be a partner all the way through the process, and that might indicate different types of brands that would play with others. JK: I think it’s the start of what’s next for sports venues, not just in the U.S., but in the world. Traditionally, venues in this country have been in places that you see a game and then you leave. But even with a baseball schedule with 81 games, which is about as busy as you can get, that’s only one in four calendar days. And you now have a $1-$1.3 billion stadia that’s open only a quarter of the year; it doesn’t make a ton of sense. You’re starting to see, like in Atlanta, the baseball stadium is in effect an anchor tenant for a lifestyle complex where people are going to live and work. Comcast will have their southeast regional headquarters on the campus, there will be a grocery store, there will be opportunities to shop, you can go on dates there. There are restaurants and live venues. You’re seeing that in Barcelona as well. That stadium today is busy every single day. It’s a museum; it’s a tourist destination. We want to give those people who are visiting even more. I don’t think it’s going to end with Barcelona and the Atlanta Braves. I think when you look at the amount that needs to be spent on a stadium today, and that’s a lot because of the expectations of people who go in terms of the way they want to eat, the way they want to get on WiFi, they want to feel secure; this is the start of what’s next for stadiums.